Abstract: Total joint arthroplasty can be associated with major blood loss and require subsequent blood transfusions for postoperative anemia. Measures to effectively and safely decrease blood loss and reduce the need for blood transfusions would help improve patient safety and lower health care costs. A possible pharmacological option to reduce surgical blood loss in total joint arthroplasty is the use of tranexamic acid. Abundant literature has shown that intravenous and/or topical administration of tranexamic acid is effective in reducing blood loss and blood transfusions, with no increased risk of venous thromboembolic events or other complications. One of the earliest randomized studies examining the efficacy of TA in reducing blood loss following total joint arthroplasty was in 1997 by Hiippala et al.7 In their study, 75 patients undergoing primary TKA were randomized to receive either normal saline or intravenous (IV) TA. The TA group showed a significant reduction in blood loss and mean number of transfused units without increase in venous thromboembolic events. The objective of this review was to comprehensively examine the use of TA as a pharmacologic agent to minimize bleeding following total joint arthroplasty. Multiple studies have shown that IV TA administration is effective and safe at the evaluated dosages in total joint arthroplasty. The efficacy and safety of topical or intra-articular administration of TA have also been extensively assessed in total joint arthroplasty. Numerous studies regarding the use of IV and topical TA in total joint arthroplasty have confirmed the efficacy and safety of TA compared with controls. 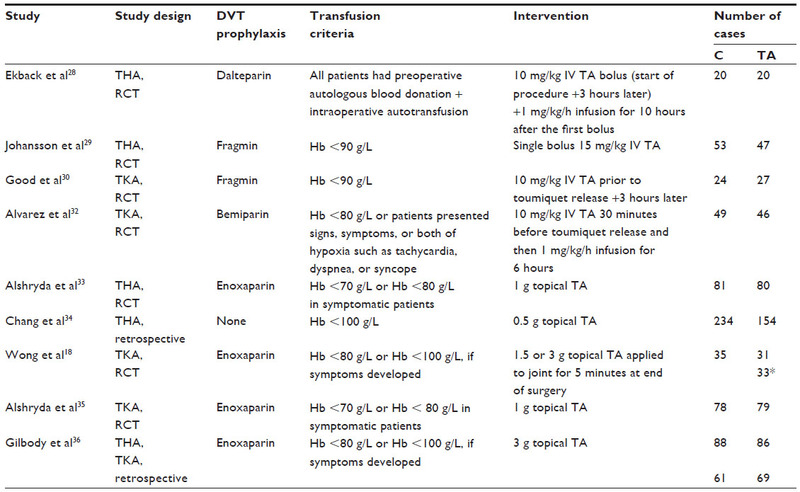 Numerous studies conducted with IV and/or topical TA in total joint arthroplasty have shown TA to reduce blood loss and transfusion requirements, with no apparent increase in venous thromboembolism events (Table 1). Indirect comparison of placebo-controlled trials of IV and topical TA indicate that topical TA application is superior to the IV administration.37 Topical TA can be a viable alternative in patients with contraindications to IV TA. Note: *indicates the 31 patients who received 1.5g of TA and 33 patients who received 3.0g of TA. Abbreviations: THA, total hip arthroplasty; TKA, total knee arthroplasty; RCT, randomized controlled trial; DVT, deep venous thrombosis; Hb, hemoglobin; IV, intravenous; TA, tranexamic acid; C, control. TA should be considered for routine use in primary THA and TKA to decrease blood loss. Approving and extending the indications for the use of TA in total joint arthroplasty would be a useful measure to reduce costs and blood transfusions. J Roderick Davey has received support from Biomet and Smith & Nephew, and has previously consulted for Biomet. None are relevant to this review. The authors report no other conflicts of interest in this work. Blumberg N, Kirkley SA, Heal JM. A cost analysis of autologous and allogeneic transfusion in hip-replacement surgery. Am J Surg. 1996;171(3):324–330. Toy PT, Kaplan EB, McVay PA, Lee SJ, Strauss RG, Stehling LC. Blood loss and replacement in total hip arthroplasty: a multicenter study. The preoperative autologous blood donation study group. Transfusion. 1992;32(1):63–67. Kalairajah Y, Simpson D, Cossey AJ, Verrall GM, Spriggins AJ. Blood loss after total knee replacement: effects of computer-assisted surgery. J Bone Joint Surg (Br). 2005;87:1480–1482. Okamoto S, Sato S, Takada Y, Okamoto U. An active stereo-isomer (trans-form) of AMCHA and its antifibrinolytic (antiplasminic) action in vitro and in vivo. Keio J Med. 1964;13:177–185. Melander B, Gliniecki G, Granstrand B, Hanshoff G. Biochemistry and toxicology of amikapron; the antifibrinolytically active isomer of AMCHA. (A comparative study with epsilon-aminocaproic acid). Acta Pharmacol Toxicol (Copenh). 1965;22:340–352. Dunn CJ, Goa KL. Tranexamic acid. A review of its use in surgery and other indications. Drugs. 1999;57:1005–1032. Hiippala ST, Strid LJ, Wennerstrand MI, et al. Tranexamic acid radically decreases blood loss and transfusions associated with total knee arthroplasty. Anesth Analg. 1997;84(4):839–844. Petäjä J, Myllynen P, Myllylä G, Vahtera E. Fibrinolysis after application of a pneumatic tourniquet. Acta Chir Scan. 1987;153:647–651. Samama CM. A direct antifibrinolytic agent in major orthopaedic surgery. Orthopaedics. 2004;27(6 Suppl):S675–S680. Hardy JF, Desroches J. Natural and synthetic antifibrinolytics in cardiac surgery. Can J Anaesth. 1992;39:353–365. Blohmé G. Treatment of hereditary angioneurotic oedema with tranexamic acid: a random double-blind cross-over study. Acta Med Scand. 1972;192:293–298. Sheffer AL, Austen KF, Rosen FS. Tranexamic acid therapy in hereditary angioneurotic edema. N Engl J Med. 1972;287:452–454. Cugno M, Cicardi M, Agostoni A. Activation of the contact system and fibrinolysis in autoimmune acquired angioedema: a rationale for prophylactic use of tranexamic acid. J Allergy Clin Immunol. 1994;93(5):870–876. Du-Thanh A, Raison-Peyron N, Drouet C, Guillot B. Efficacy of tranexamic acid in sporadic idiopathic bradykinin angioedema. Allergy. 2010;65(6):793–795. Andersson L, Nilsson IM, Nilehn JE, Hedner U, Granstrand B, Melander B. Experimental and clinical studies on AMCA, the antifibrinolytically active isomer of p-aminomethyl cyclohexane carboxylic acid. Scand J Haematol. 1965;2:230–247. Eriksson O, Kjellman H, Pilbrant A, Schannong M. Pharmacokinetics of tranexamic acid after intravenous administration to normal volunteers. Eur J Clin Pharmacol. 1974;7:375–380. Ahlberg A, Eriksson O, Kjellman H. Diffusion of tranexamic acid to the joint. Acta Orthop Scand. 1976;47:486–488. Wong J, Abrishami A, El Beheiry H, et al. Topical application of tranexamic acid reduces postoperative blood loss in total knee arthroplasty: a randomized, controlled trial. J Bone Joint Surg (Am). 2010;92:2503–2513. Nilsson IM. Clinical pharmacology of aminocaproic and tranexamic acids. J Clin Pathol Suppl (R Coll Pathol). 1980;14:41–47. Pilbrant A, Schannong M, Vessman J. Pharmacokinetics and bioavailability of tranexamic acid. Eur J Clin Pharmacol. 1981;20(1):65–72. Fiechtner BK, Nuttall GA, Johnson ME, et al. Plasma tranexamic acid concentrations during cardiopulmonary bypass. Anesth Analg. 2001;92(5):1131–1136. McIntyre CW, Owen PJ. Prescribing drugs in kidney disease. In: Brenner BM, editor. Brenner and Rector’s The Kidney. Philadelphia, PA: Saunders; 2008:1930–1953. Laffey JG, Boylan JF, Cheng DC. The systemic inflammatory response to cardiac surgery: implications for the anesthesiologist. Anesthesiology. 2002;97:215–252. Jiménez JJ, Iribarren JL, Brouard M, et al. Safety and effectiveness of two treatment regimes with tranexamic acid to minimize inflammatory response in elective cardiopulmonary bypass patients: a randomized double-blind, dose-dependent, phase IV clinical trial. J Cardiothorac Surg. 2011;6:138–148. Tengborn L, Blombäck M, Berntorp E. Tranexamic acid-an old drug still going strong and making a revival. Thromb Res. 2015;135(2):231–242. CRASH-2 trial collaborators. Effects of tranexamic acid on death, vascular occlusive events, and blood transfusion in trauma patients with significant haemorrhage (CRASH-2): a randomised, placebo-controlled trial. Lancet. 2010;376:23–32. Poeran J, Rasul R, Suzuki S, et al. Tranexamic acid use and postoperative outcomes in patients undergoing total hip or knee arthroplasty in the United States: retrospective analysis of effectiveness and safety. BMJ. 2014;349:4829–4839. Ekback G, Axelsson K, Ryttberg L, et al. Tranexamic acid reduces blood loss in total hip replacement surgery. Anesth Analg. 2000;91:1124–1130. Johansson T, Pettersson LG, Lisander B. Tranexamic acid in total hip arthroplasty saves blood and money: a randomized, double-blind study in 100 patients. Acta Orthop. 2005;76:314–319. Good L, Peterson E, Lisander B. Tranexamic acid decreases external blood loss but not hidden blood loss in total knee replacement. Br J Anaesth. 2003;90:596–599. Cid J, Lozano M. Tranexamic acid reduces allogeneic red cell transfusions in patients undergoing total knee arthroplasty: results of a meta-analysis of randomized controlled trials. Transfusion. 2005;45:1302–1307. Alvarez JC, Santiveri FX, Ramos I, Vela E, Puig L, Escolano F. Tranexamic acid reduces blood transfusion in total knee arthroplasty even when a blood conservation program is applied. Transfusion. 2008;48:519–525. Alshryda S, Mason J, Sarda P, et al. Topical (intra-articular) tranexamic acid reduces blood loss and transfusion rates following total hip replacement: a randomized controlled trial (TRANX-H). J Bone Joint Surg Am. 2013;95(21):1969–1974. Chang C-H, Chang Y, Chen D, Ueng SN, Lee M. Topical tranexamic acid reduces blood loss and transfusion rates associated with primary total hip arthroplasty. Clin Orthop Relat Res. 2014;472(5):1552–1557. Alshryda S, Mason J, Vaghela M, et al. Topical (intra-articular) tranexamic acid reduces blood loss and transfusion rates following total knee replacement: a randomized controlled trial (TRANX-K). J Bone Joint Surg Am. 2013;95(21):1961–1968. Gilbody J, Dhotar HS, Perruccio AV, Davey JR. Topical tranexamic acid reduces transfusion rates in total hip and knee arthroplasty. J Arthroplasty. 2014;29(4):681–684. Alshryda S, Sukeik M, Sarda P, Blenkinsopp J, Haddad FS, Mason JM. A systematic review and meta-analysis of the topical administration of tranexamic acid in total hip and knee replacement. Bone Joint J. 2014;96(8):1005–1015. Gomez-Barrena E, Ortega-Andreu M, Padilla-Eguiluz NG, Pérez- Chrzanowska H, Figueredo-Zalve R. Topical intra-articular compared with intravenous tranexamic acid to reduce blood loss in primary total knee replacement: a double-blind, randomized, controlled, noninferiority clinical trial. J Bone Joint Surg Am. 2014;96(23):1937–1944. Gandhi R, Evans HM, Mahomed SR, Mahomed NN. Tranexamic acid and the reduction of blood loss in total knee and hip arthroplasty: a meta-analysis. BMC Res Notes. 2013;6:184.